A report outlining a practical vision of how to give cyclists, pedestrians and public transport extra space on Dublin city centre streets is expected to be finalised and released in the first half of this year. 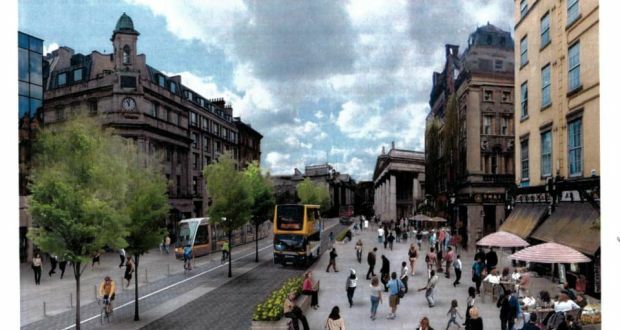 Following the coverage of the Draft City Centre Transport Assessment Study, by the The Irish Times in September, this publication requested a copy of the draft study from the National Transport Authority and Dublin City Council. Both rejected the request which was made under environment freedom of information, the Access to Information on the Environment (AIE) regulations. However, in its rejection letter in October, the NTA said: “It is anticipated that the study will be finalised and available in the first half of 2014.” It said Dublin City Council and the NTA continue to work on the study. COMMENT: Due to our own time constrains we were unable to appeal the decision. However, this publication is of the view that the public interest is not severed by the debate about the future of Dublin’s streets happening behind closed doors between the council and the NTA. Given that the draft study was complete enough to include artist’s impressions, once the document was leaked to The Irish Times it should have also been released publicly with the clear warning it was a draft document. If the behaviour of Dun Laoghaire Rathdown CoCo is anything to go by, in relation to taking public opinion into consideration this will be yet another another exercise in wasting hard to come by public funding without really satisfying any real road users needs. Hi Cian, have there been any new developments around this proposal?